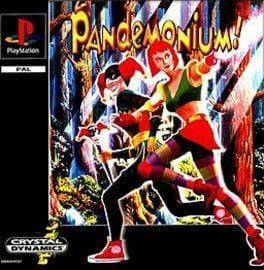 Pandemonium features 2 playable characters: Fargus, a joker, and Nikki, who unwittingly casts a spell that destroys the town. The goal of the game is to reach the Wishing Engine, where they can wish the town back to normal. For each level, the player can choose which character to be. Each has a special move - Fargus can deliver a special spinning attack, and Nikki can double jump. The game consists of a great variety of unique gameplay objects, such as watermelons, clouds, spider webs and logs. Pandemonium! is available from 3.27 to 6.99 from 1 shops.